Are 17-Year Cicadas a Threat to Ohio Landscapes? Did you happen to hear a lot of noise this past May and June coming from the trees around your office building or home? That unique noise was the periodical, or 17-year, cicadas.I find it fascinating that periodical cicadas started as eggs back in 1999 and lived underground in the nymphal stage, feeding on sap from tree roots until recently emerging in 2016. People have asked me if the periodical cicadas will kill their trees or shrubs. In most cases, the answer is no. Periodical cicadas are technically parasites of trees and need trees to survive. They don’t damage trees by chewing leaves like other insects, but can damage young, tender tree branches while laying their eggs. You may have noticed numerous brown hanging branch tips in trees this past summer—that’s the cicada damage called flagging. The term flagging is used because the leaves of a damaged branch will turn brown and look like a hanging flag. According to the Ohio State University Extension, “Over 270 species of tree, vine and woody shrubs have been documented as supporting the eggs of periodical cicadas.” Some of the preferred host trees of cicadas are maple, oak, hickory, beech, ash, willow, dogwood, hawthorn, magnolia, apple, pear, peach and cherry. They avoid evergreen trees because the sap interferes with their egg nests. Cicadas pose the largest threat to ornamental and young deciduous trees because they have fewer branches and may not be able to tolerate the flagging. Shrubs, flowers and vegetables aren’t typically an ideal for cicada egg-laying and seem to only be used by cicadas if the emergence is particularly heavy in an area. Do note that branch dieback can be caused by other tree problem. To confirm cicada damage, check the branch behind the declining foliage and look for small slits in the branch where cicadas lay their eggs. If you haven’t seen or heard cicadas and don’t find the scars from egg-laying, the branch dieback may have been caused by something else and further investigation by a tree expert may be needed. There have been several invasive insects found in Ohio that have caused serious damage to trees, but in most cases the periodical cicadas are not one of them. 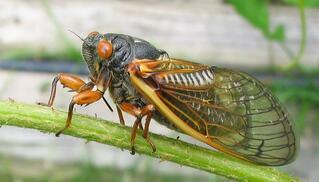 So mark your calendar for May 2033, sit back and marvel at the awesome 17-year cicadas. Your trees and shrubs should be safe!